NECA members have organized a special prayer breakfast on Sunday morning, Oct. 23, at the San Diego Convention Center before convention management workshops begin. The doors will open at 6:45 a.m., and the program will begin at 7 a.m., ending at 7:45 a.m. This prayer breakfast will be the first time we have offered this event at the national convention, and all faiths are welcome to participate. Speakers have been invited to share their experiences on balancing work, family and faith. There will also be music and time of prayer for our business, our county and our families. This event is not part of the NECA 2011 San Diego Convention registration, so you must register separately online or on-site at the registration desk in San Diego. The registration desk will open on Sunday, Oct. 23 at 6:30 a.m. for those that want to register before the breakfast. The prayer breakfast is open to anyone attending NECA 2011 San Diego. There is a charge of $25 per breakfast attendee to cover food and meeting facilities costs. Early Registration Extended – Take Advantage Now! Early registration for NECA 2011 San Diego has been extended by one week, to Monday, Sept. 5, but that doesn’t mean you’ve got time to spare! Register now to make sure you’ve got a place with your fellow industry leaders to share best practices, new market intelligence and scope out new tools and technology, all in one location, all for the year’s most affordable event! Spaces are nearly filled, and San Diego hotel blocks will close soon. You need to be with NECA in San Diego, Oct. 22-25! So don’t delay – register now! Labor Relations Special Session Announced! NECA 2011 San Diego’s Labor Relations session is all about pension plan burden and liability. Join us for an in depth presentation on the future of the Pension Protection Act (set to expire in 2014); actuarial considerations in the light of the recent Financial Accounting Standards Board’s (FASB) efforts to impose more stringent reporting requirements on contractors; and an update from president-elect Dennis Quebe, chairman of NECA’s Labor Relations Task Force, on what NECA is doing to educate and prepare member contractors about the current and future state of local pension funds and potential options and actions that can be taken to remain competitive. The Labor Relations Special General Session at NECA 2011 San Diego will be presented Monday, October 24, 10:00-11:30 a.m. at the San Diego Convention and Exposition Center. It’s open to everyone who is registered for the full Convention. Early registration ends Monday, September 5! Early Registration Extended Until Sept. 5! Recent phone and service outages at NECA’s national office means a little good news for procrastinators – the Early Registration deadline for NECA 2011 San Diego has been extended by one week, from Monday, Aug. 29 to Monday, Sept. 5. Registrants who have not booked hotel accommodations for NECA 2011 San Diego should do so immediately. CMR, NECA’s only housing agent for the events in San Diego, will release any rooms that have not been reserved on Sept. 5. The best way to reach NECA’s convention staff is a direct email to Beth Ellis at beth.ellis@necanet.org or Katie Nolan, katie.nolan@necanet.org. CMR staff can also assist with NECA 2011 San Diego registration and housing registrations by email to NECAHousing@cmrus.com or phone, 1-800-368-6322 or 415-979-2291 for international calls. You can also comment on this post, our Facebook page or on Twitter. NOTE: Early registration rates do not apply to pre-convention workshops,Weekend Passes, or the Energy Forum. >> REGISTER NOW FOR NECA 2011 SAN DIEGO! NECA’s 2011 lifestyle session features Joan Embery – renowned environmentalist, animal activist, preservationist, TV star and spokeswoman for the Zoological Society of San Diego – plus, some of her favorite friends, the exotic animals she cares for! Joan, a regular on the Tonight Show, made numerous appearances with Johnny Carson, allowing viewers to meet and share in her love of the animal kingdom, all from their living room sofa. From sneaky snakes and albino koalas to Johnny singing to an endangered bush dog, millions of Americans have learned about the importance of wild life conservation from Joan and her furry friends. Are You Trying to Reach Us? NECA’s phone system is currently down — if you need immediate assistance, or need to make a request to convention staff, please contact Katie (katie@necanet.org) or Beth (eie@necanet.org) via email. We will publish an immediate update when our phone system is back up and running. We apologize for any inconvenience — thank you for your patience. There’s never been anything like the Energy Forum for the electrical construction industry that kicks off NECA’s 2011 Convention and Trade Show in San Diego. Making sense of the range of opportunities in green energy will be the focus of this all-new event which will be held on Saturday, October 22, 8:00 a.m.-3:30 p.m. Speakers and session leaders will discuss the many ways electrical contractors can enter this market and what questions they need to ask. In addition to hearing an exciting keynote address from Jon Wellinghoff, chairman of the Federal Energy Regulatory Commission (FERC), Energy Forum participants will hear from industry experts on energy economic modeling, the electric vehicle market, and innovative energy storage technology. An informational brochure is provided through the link to “Related Documents” at the end of this article. According to ELECTRICAL CONTRACTOR magazine, alternative power and energy efficiency upgrades are the next boom market for contractors. We don’t want to lose what could be the largest game-changing trend to hit our industry in the past two decades. Right now, there is tremendous momentum and incentives for sustainable construction. With those new energy markets come services like installing and maintaining electric vehicle supply equipment, designing “net-zero energy” buildings with integrated systems, and energy storage. Energy work is “counter-cyclical” — meaning, that in tough economic times, your customers want and need to save money on operating costs. Energy work is a revenue opportunity independent of the construction market. For building owners and operators, the savings and tax credits energy solutions deliver are very desirable. When an electrical contractor can help them save money, it doesn’t matter how healthy the rest of the construction market may be. Whether it’s utility-grade wind power, solar PV installations or helping a customer save on his electric bill by swapping out old ballasts for energy-efficient LED drivers, NECA’s 2011 Energy Forum will cover all the options and opportunities in the new energy economy. The good news is that many electrical contractors already have the technical knowledge to engage with these markets — but most don’t know how to integrate energy services into their existing businesses or market their capabilities to existing and potential customers. There isn’t one right way to incorporate energy efficiency, conservation and renewable power into an electrical contracting company. Moderators and presenters at the Energy Forum all come from the front lines of the industry to help contractors answer when and how they can add new energy services to their traditional business models. These days, everyone is doing more with less. If you want to minimize the time and money you spend away from the office, while maximizing your education and experiences in San Diego, the Energy Forum will give you the biggest potential gain for your business. The Energy Forum was proposed by NECA’s Energy Solution Task Force members who are electrical contractors just like you. And like you, we are each trying to determine what our place in the emerging energy solutions market can and should be. The Energy Forum was developed to help contractors answer some of those questions. We understand that there isn’t a single path of entry for all NECA member companies to pursue this work. But we also know that if we don’t begin immediately offering our expertise and services, customers will go elsewhere to get their renewable and energy-efficiency needs met. —Is there a tool I can use to show realistic projections for energy and cost savings to customers? —What types of financing are available for renewable energy projects, and how could financing be impacted by future regulations? –How do we integrate renewable energy and energy efficiency to ensure reliable power? “How and where we get our energy has become a serious question for building owners, government leaders and developers. Rising energy prices and energy inefficiencies have everyone thinking about what the smart alternatives could be, but those alternatives have to make financial sense, both for the customer and the electrical contractor,” said Rob Colgan, NECA executive director, Market Development. Alternative power and energy efficiency upgrades are the next boom market for contractors, Lazarian said. “But it’s hard for electrical contractors to know when it’s the right time for them to add new services to their traditional business model,” he said. Looking for some great ideas to fill up your time while in San Diego for the NECA Convention & Trade Show? The San Diego Convention Center has put together a handy pocket guide filled with the best places to go, things to do and exciting sights to see! View area maps, tourism tips, find restaurants and much more! 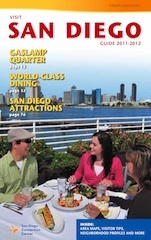 To download a copy of the “Visit San Diego Guide” or have it mailed to you for free, visit the San Diego Convention Center website! Children Welcome at the NECA Show! Children are welcome at the 2011 NECA Show, just as long as they have a badge for admission and are accompanied by an adult. But this year, kids aren’t just welcome to check out all the cool exhibits on the Show floor. We’re also opening other NECA Convention activities to kids who are registered with badges and accompanied by an adult. Ellis said that 2011 marks the 100th anniversary for naval flight, so there will be special exhibits and areas for exploring at the Opening Reception, Oct. 22. “It’s a once-in-a-lifetime opportunity, and we want everyone in our NECA family to experience it,” Ellis said. >>Register yourself or your children for the 2011 NECA Convention and Show now!